A very impressive match as far as I was concerned from Roger. Heading into the match I knew Cilic would be a test, but ultimately I fancied Fed to progress without too much trouble. I predicted straight sets in my Sela match review post and after a very convincing first set from Roger it looked to be heading that way. Fed did end up dropping a set, but this actually turned to be a good thing, as we got to see how he bounced back from that. Recently he's let matches slip away and lose enthusiasm but today he looked very determined to get back on track. The first set was very impressive from Federer – his backhand immediately clicked and he was striking the ball very sweetly. At 1 game all, he slipped to 0-40 but staved off all 3 break points with some clinical net play and held. He then broke Cilic in the next game with a huge forehand down the line which had the Croat stretching. The first set really showed that Roger was up for the match today and was willing to win at all costs, he saved break points, and had a definite tactic of getting to the net as much as possible, which paid off dividends. 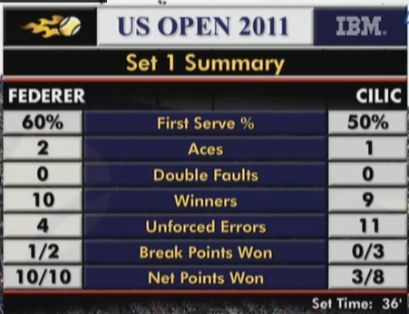 As you can see from the first set statistics below, Roger was very solid. In the second set Rogers level dropped somewhat and Cilic started to find his range. If anything Roger was guilty of settling into a complacent groove and playing way too passively. For a few moments, it did look to be heading the way of Tsonga at Wimbledon. Cilic took the set 6-4. Federer fashioned a break in the opening game of the third set, so it looked like he had knuckled down and ridden out Cilic playing well. However, in typical Fed-of-late style he got broken to love in the next game. The set was well poised at 4-4 when Roger upped the anti – the tactic of the slice backhand onto the Cilic backhand followed up by an inside out forehand really worked to perfection. At 6ft 7″ the low ball is always going to be tough for Cilic to handle, he couldn't get enough purchase on the ball to prevent Roger running around his backhand and getting on top of the rally. After a rather unfair time violation, Cilic served a double fault which gave Roger the break and he held serve to take the set 6-4. The 4th set was never really in doubt, the Croats resolve seemed to have been broken and Federer was definitely on the ascendency, he broke, saved a break point himself with a huge first serve, then secured the double break and served out the match with ease. Marin is a very aggressive baseline player, he’s tall, he’s strong,” Federer said after the match. “I was very happy the way I was able to crawl out of the match. What was impressive about Federers Victory? This was a tough match up, and I think Roger came through the test with flying colours. All his shots seemed to be functioning pretty well, the forehand was big and the backhand was solid. But perhaps best of all, Fed showed alot of desire to win, and was clearly up for the match – he used tactics, aggression and gave some pretty big come ons after winning big points, which is always nice to see. I'm glad Roger had a plan, and didn't let the loss of a set derail his entire match. If anything it spurred him on that bit more and I'm happy this was the case. However, I'm not getting carried away with Rogers victory, I did that after he played the perfect match against Del Potro in Cincinnati last month and we all know what happened after that. But a part of me thinks these circumstances are way different so I'm confident he can make the semis. 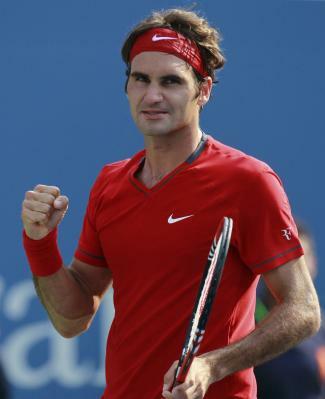 In the 4th round Federer will face either Juan Monaco or Tommy Haas. I'll pick Monaco as the likely opponent but I think him and Haas will go five, but he'll just edge Tommy on the fitness front. Neither of these 2 pose a threat for Roger, I like Haas and he plays some pretty good tennis, but he's quite old and doesn't have the weapons to hurt Roger – they last met at Wimbledon in 2009 and that was an easy match. Federer leads the H2H with Monaco 2-0 – he beat him in Miami earlier this year in straight sets, and I remember Roger played a poor match that day and served like a douche. So if Monaco couldn't beat him then, I give little chance in the 4th round of a Grand Slam. So Monaco got past Haas in 4 sets. I didn't watch any of the match so difficult to say if the quality was high. I can't see Monaco troubling Roger one bit. In fact it would be good to see this guys record against top 10 opponents in his career, I have a feeling it's not great. I've seen him take sets off players but never seems to come through. No doubt he would be more at home on a clay court so I'll opt for a straight sets victory – 6-2 7-6 6-3. Elsewhere in the draw Murray scraped through in 5 sets against Dutchman Robin Haase. Murray played so passively, if Haase hadn't choked he should be out. He's dull and watching that match just annoyed me. The fact is Andy Murray is bad for tennis. Nadal had an easy match after Mahut retired probably still tired from Wimbledon '10 so he continues on his cake walk draw. Djokovic destroyed Berlocq serving up a double bagel, he plays Davydenko later tonight, I see Davydenko living with Djokovic early and the first set being tight, but after that plain sailing for Novak. Donald Young upset Wawrinka to the delight of the home fans. I kinda thought that was to be expected because Stan has had a pretty piss poor season. Del Potro is sneaking through under the radar so far along with Dolgopolov. Serb Janko Tipsarevic beat an injured Thomas Birdshit after he retired. Becoming the 18th player to retire this tournament. Many players are now using this as reason to moan about the schedule. It is pretty hectic but they get paid well enough so I don't see it as a big deal.